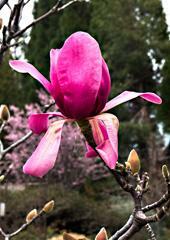 Nevada County gardens vary widely. Elevations range from 1,000 to 4,000 feet. Soil types are red clay, serpentine, sandy loam, forest loam or something in-between. Generally acidic, soils may lack necessary nutrients and organic matter. Some gardens are below the snowline, while others are often covered with snow and may have frozen soil for an extended time. We know that “One size does not fit all.” Gardening in Nevada County is unlike gardening elsewhere and it is not the same throughout the county. 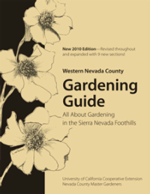 Master Gardeners are here to provide home gardeners in Nevada County with science-based information, whatever their gardening conditions. And, Master Gardeners offer a number of workshops and events to achieve this goal. Do you have a question about gardening? Click here to find out how to reach us. Spring Plant Sale in May! 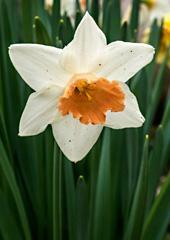 Our popular Spring Plant Sale will be held Saturday, May 11 from 9am to noon at the Demonstration Garden on the NID grounds, 1036 W. Main Street in Grass Valley. Prepare your gardens for some of the wonderful vegetables, herbs and flowers started nurtured by the Nevada County Master Gardeners! 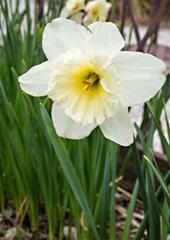 Click here to download a partial list of plants to be offered. The Demonstration Garden at 1036 W. Main Street, Grass Valley, (on the NID grounds) offers a wonderful variety of plant venues. Including an orchard and oak habitat, the Master Gardener's Demonstration Garden offers visible learning opportunities for the public. Check out the map of the garden: Demonstration Garden Map. 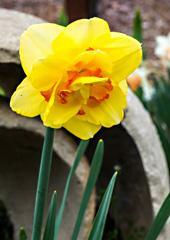 If you would like to schedule a group tour led by a Master Gardener, please call our Hotline office (530) 273-0919. “Rain, rain, go away! Come again another day!” While we wholeheartedly welcomed the plentiful rain this winter and early spring, we felt rushed to take advantage of the few fair days that came our way. One day the Orchard Team transplanted the blueberries into new oak wine barrels. The plants thrived as if they had never been moved. The hoop house now has doors and there are benches for the growing plants. Some work remains to be done before our growers for the May plant sale will be able to move in. The calendar says it is spring even though the skies are grey, so we looked around the Demo Garden to see what is blooming. 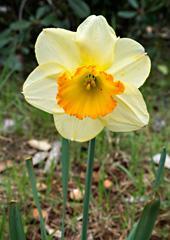 Many different daffodils were showing their happy faces in spite of so much rain. 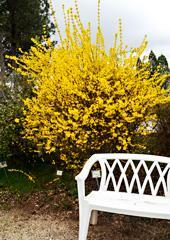 Lighting up the Cottage Garden, blooming Forsythia echoed the color of the yellow daffodils. Hellebores nodded their flowers under the fig tree. In the Foothill Garden, we admired lovely magenta magnolias and spied a small clump of white violets blooming nearby. Then we traipsed down to a corner of the Oak Habitat, behind the blooming Emerald Carpet and under tall shrubs not yet in leaf, to seek the hidden pinkish-purple violets. On the way back we found the last of the Sentinel manzanita urn-shaped flowers, peeked under the manzanita to find dangling fuchsia-flowered gooseberry blooms, and admired the sunshine yellow of Oregon Grape. In the orchard we noticed blossoms on the blueberries and the nectarine, as well as more daffodils. Yes! So many flowers announced that spring has arrived. We’re ready for a new season of growth.